Nothing says “Welcome” to all who enter your home, like a beautiful front door and a cheery wreath. Did you know that one of the easiest and cheapest ways to boost your home’s curb appeal is to simply paint your front door? The last few years, it seems the trend in front door colors has leaned toward a vibrant red. This bright spot of color in the façade of your home helps it to stand out from the other homes on the block. You’re lucky if you have just the right brick color to accomplish this feat and the beautiful red hue does not try to compete with the color of the bricks of your home. It is not necessary to paint your front door the same color as the home’s trim or shutters in an effort to create a harmonious look, because, in fact, this could create a blah, humdrum look – why not opt to create a door which makes an impact to the front of your home? 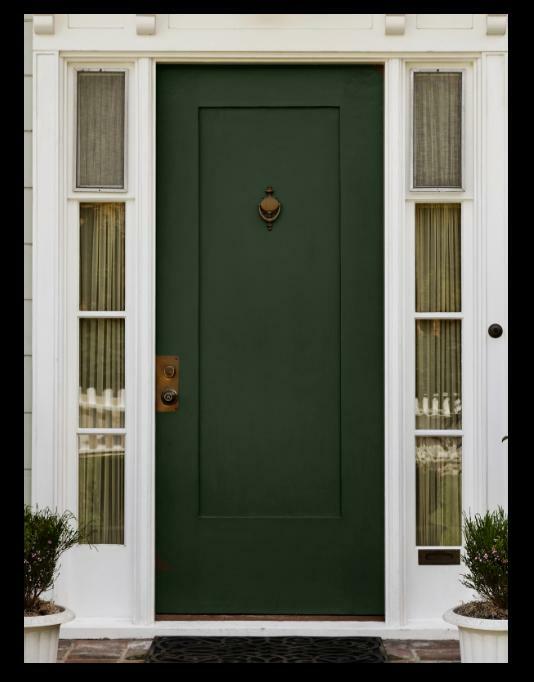 With all the colors in the palette available for the front door of your home, before you commit to a final choice, bear in mind that the color of the door can convey a certain coziness or elegance, depending on the hue you choose. A sunny yellow or brilliant turquoise can create energy at the front door, especially when paired with porch pots with bright-colored flowers spilling out the top. Our Far Eastern friends have long considered a red door to bring good luck and good fortune to the homeowner, and today, more and more shades of red or burgundy are showing up on front doors. A subdued shade for the front door is more in tune with a traditional-looking house and speaks to elegance. Darker colors are perfect for large and stately homes and lighter and brighter colors for more medium-sized homes. You may feel inspired, but there are some certain unwritten “rules” about mixing and matching your colors. An old Victorian home will look much better with a pastel-colored door, and then a door painted in a dark tone. A contemporary home, and even a cottage or farmhouse-style home will look cheery with a bright yellow door, but you wouldn’t want that color on a staid and formal-looking English Tudor-style home. You must take into consideration the style of your home, its trim, and even the landscaping before making your paint choice. If you’re unsure, you might want to consult with an experienced exterior painting contractor in Nassau, New York, to get an idea of what the best color combo for your home might be. The two, most-popular styles of home are traditional and contemporary. At a traditional home, you’ll usually find a front door painted in a rich deep color, such as black, navy blue, green or dark red, while contemporary homes often feature front doors with bold colors. On the other end of the spectrum, is the cottage- or farmhouse-style home which often sports a front door in bright colors from nature. Light and deep colors are more eye-catching than medium shades. Light colors, like white, cream, taupe and tan, are best when used to contrast with a dark color on the home’s exterior, because, if matched to same-color siding, it invites a look that is bland and boring. White is nice and timeless but can be difficult to keep it looking fresh and clean all the time. Pink and mauve are the least-favorite door colors, closely followed by orange, purple, gray and pale yellow. Surveys show that homebuyers’ favorite door colors are white or red, followed by blue, green and brown. Keep in mind that you need to keep the door looking fresh and clean. White can be difficult to keep looking that way. Whatever front door color choice you make, make that front door just as cheery as your Welcome mat and don’t forget to hang a beautiful wreath up as well to add the finishing and crowning touch.